This one-day workshop brings together researchers who are working in both life sciences and materials sciences to discuss common transmission electron microscopy methods and new instrumentation that will advance both disciplines. Scientific challenges in both areas have developed in similar directions, blurring the boundary between both topics and presenting an opportunity for synergy. For example, the development of atomic resolution techniques to study the structure of viruses and proteins has only recently been explored in the life sciences although it has been readily available for TEM studies in materials sciences for several decades. Similarly, spectroscopy, primarily used for materials science, could benefit biological topics greatly. On the materials science side, analysis of radiation sensitive materials, such as small catalytic particles and polymers can benefit from the low-dose, high-contrast methods which have been developed for biological samples. New in-situ techniques that allow samples to be analyzed in liquid or gas environments which more closely mimic native or application specific conditions are also of great interest to both communities. These opportunities have been made possible by advances in instrumentation within the last decade including sensitive detectors, automation of complex experiments, computational power to evaluate massive amounts of data, and aberration correctors that allow us to reach sub-angstrom resolution. 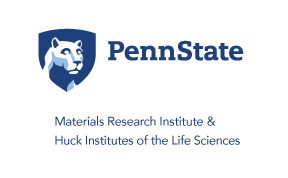 This workshop is part of the new Common Vision initiative established by MRI and Huck Institutes to foster collaboration between life sciences and material sciences. More information can be found here. Date and Time: November 3 from 8:00 a.m. - 4:00 p.m. Registration is FREE, but you must register to attend this workshop. Limited to 100 registrants. Telephone: Christine Mellace at 814-865-2328 for further information if needed. A panel discussion will address critical questions related to the topic of convergence such as: What are the common topics? What instrumentation is needed? What is the best organizational structure?